Our low-inertia brush DC servo motors are no longer available for new applications. We continue to service them for existing customers. 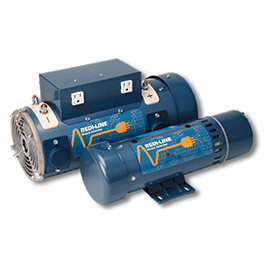 Our Redi-Line Series provides quiet, convenient 120 or 230 Vac power for mobile and remote applications. These rugged, reliable generators operate from vehicle batteries and convert DC power to AC to run tools, appliances and other electrical equipment in locations where convenient AC power is not available.